One of the fastest method which I have always been using to access a shared folder on a computer in a local network is by pressing Win+R followed by double backslash and computer, for example, \\raymond which will access a computer named Raymond in the network. If the shared folder is not password protected, then anyone is able to access, no problems there. However if the shared folder requires you to enter username and password, entering a valid credential will cache the credentials until you restart or log off Windows. This is a convenience feature that Microsoft has implemented since early versions of Windows. However there may be times when you do not want to log off or restart the computer so that you can use another login to access the shared folder. Although Microsoft did not include a simple button to flush the credentials cache so that you can try a different password, here is how you can do it via a simple command line. 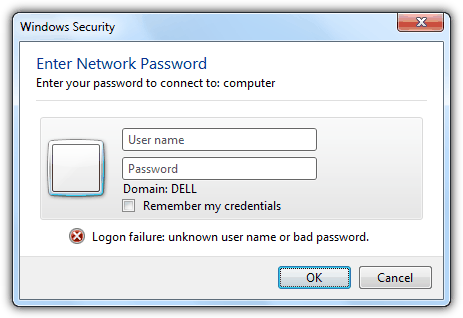 The image below shows a security window asking for username and password to access the restricted shared folder. Entering a valid username and password will allow you to access the restricted shared folder. Follow the simple steps below on how to clear the credentials so that you can use another username and password. 1. Click the Windows Orb button located at the bottom left. 2. Type cmd at the Search programs and files bar and hit the Enter key. 3. Type net use * /delete /yes and hit the Enter key. You will see that it says You have these remote connections, continuing will cancel the connections. The command completed successfully. You will have to wait for a while, probably 30-60 seconds for the credentials cached to be cleared. Try accessing the shared folder again after 30-60 seconds and you will be asked to enter network password. If you’ve checked the “Remember my credentials” check box at the Windows Security window, then you will have to go to Control Panel > Credential Manager and remove the saved Windows Credentials by clicking the Remove from vault link.